Shop DutchCrafters for all your country and traditional dining room needs including this beautiful double pedestal table. Made using your choice of oak, cherry, maple or walnut wood and then finished in any shade your desire from light to dark stains, paints and two tone paint and stained finish. 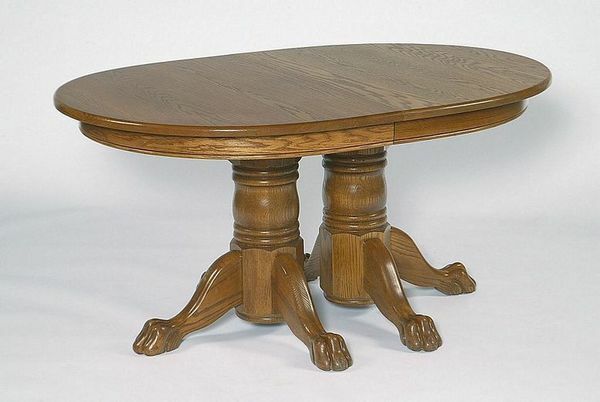 This pedestal table is quality constructed using Old World Craftsmanship techniques by an Amish woodworker. It is sturdy, solid wood construction and sure to become a family heirloom that is passed on for generations from parents to children to grandchildren. Pair this pedestal table with our Amish handcrafted dining chairs. Windsor chairs are a very popular option with this table such as our New England Windsor Chairs, Malibu Windsor Chairs, or the Early American Classic Windsor Chairs. Call one of our friendly Amish furniture specialists today to get an order started or stop by our store in Sarasota, Florida so we can sit down and talk face to face.